Are you looking for a unique, beautiful, and fully functional fire insert for your home? The Dimplex Sacramento Opti-Myst electric fire is the world's most realistic fire insert that is sure to compliment any home's decor with its stylish features. The Sacramento is made using only the highest quality materials available which include a stylish chrome insert, detailed coals, life-like flames, and a beautiful black surround. Whether you're looking for a functional fire insert or a feature piece, the unique opti-myst smoke effect is sure to stun. Use this insert to heat your home or simply enjoy the flame and smoke effect- it's your choice as the flame and smoke effect can be used with or without the heat feature. 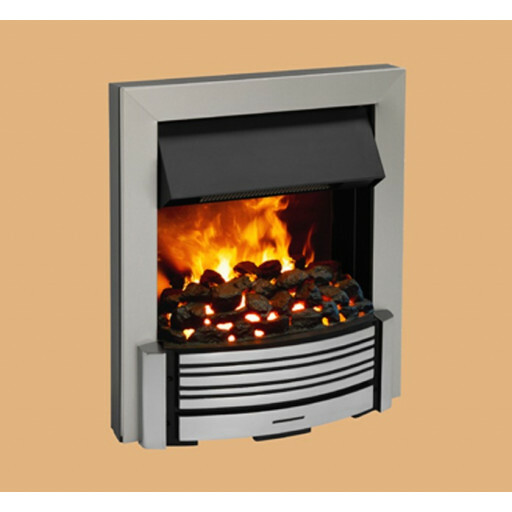 This fire insert has a 2kW fan heater that has two heat settings perfect for adjusting the warmth to your personal needs. It features flame intensity control for when you want a blazing fire or a small fire burning in the background. The fire insert has a thermostat, and comes with a remote control for your convenience. Order the Dimplex Sacramento Opti-Myst electric fire today! Most realistic electric fire we have seen,really modern looking and great smoke effect,more expensive than most other electric fires but well worth it.